You decide to buy a new boat. Send several large checks to the builder, drop in occasionally to check progress and to make suggestions. And then, guess what? You don&apos;t get invited to the sea trial. Some owners are new to boating and don&apos;t understand that running a big diesel engine at wide open throttle, both in and out of gear, isn&apos;t going to destroy it. They don&apos;t see the value in cutting doughnuts in the sea by making fullspeed turns with the rudder hard over. If the water heater leaks or the lights don&apos;t work they may begin to wonder about the wisdom of their investment. They may be buying their first boat and may not know what goes on aboard a boat at sea. 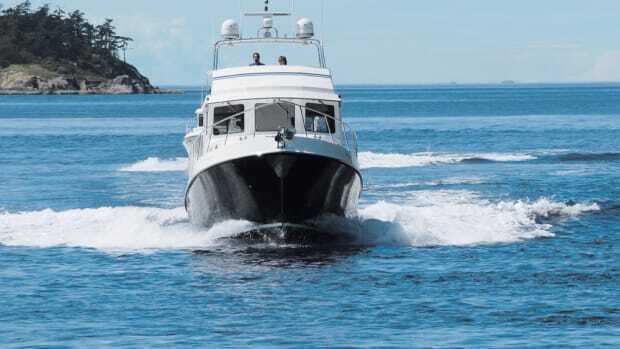 The purpose of a sea trial is to shake loose those troubles and then to get them fixed, so that when a boat is delivered to its new owner it will be ready for a long life without problem. It is not a basic course in boat ownership. So, buyers usually aren&apos;t invited along. The builders of the popular Nordic Tugs recently pulled aside the curtain of secrecy that normally obscures sea trials and invited me to join them for the shakedown cruise of a 37-foot Nordic Tug. Another builder once rebuffed my request to witness a sea trial on a new boat, so the invitation from Nordic Tugs was welcomed and quickly accepted. No conditions were imposed. I would report what I observed. Nordic Tug officials recognized they were taking a risk, but they obviously had confidence in their boats and the men and women who build them. From the moment we stepped aboard it was an adventure in smart, dedicated seamanship. Nordic Tugs builds its family of tug-yachts in a large new plant in an industrial park near Burlington, Washington. Boats are loaded on a transport trailer for the 10-mile journey to the sea at Anacortes. Jerry Husted, a founder of Nordic Tugs who has conducted sea trials on almost all of the more than 500 boats the company has built. Chuck Gaylord, a man of many trades who once built small Sparrow sailboats, and a longtime friend of Husted who has assisted in many Nordic sea trials. 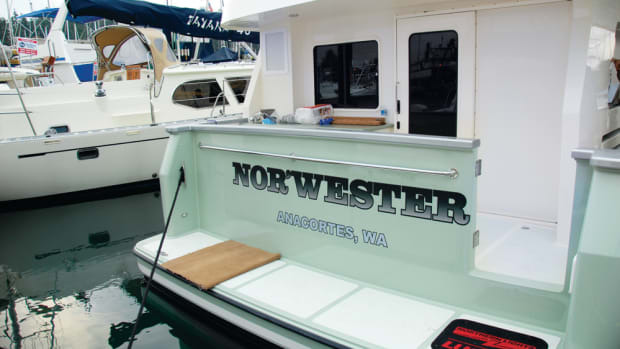 And, finally, there was Alfredo Betancourt, a fiberglass laminator at Nordic Tugs, who had never driven a boat before but who learned how that day. The company sends one plant worker on each sea trial, partly as thanks for good work but also to help them understand what boating is all about. This was Alfredo&apos;s day. Also there was the man who would be left behind: Tom Burke, the owner-to-be of the 37 and the former owner of a 32-foot Nordic Tug. Obviously pleased to see his boat ready for launching, Burke then began doing something that seemed unusual. Using a brush, he coated the four blades of the 28-by-24-inch propeller with STP oil treatment. 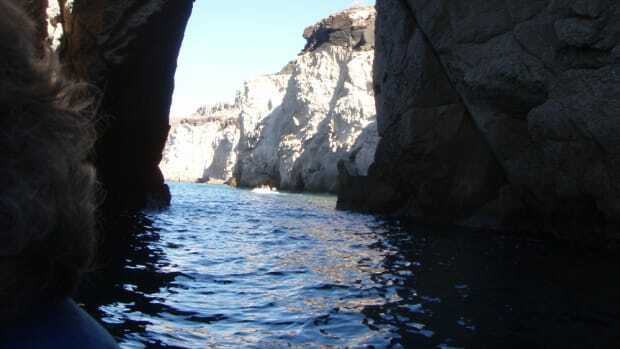 It has been proven, he insisted, to prevent the growth of barnacles on the prop. No barnacle could survive the hours of thrashing we gave that propeller during the sea trial, so there was no test of the goop theory. Maybe later. A Cap Sante Marina Travelift plucked the 37 from its trailer, recorded its weight at 21,760 pounds and then carefully lowered the boat into the water. The crew swarmed aboard and dove belowdecks. Were there any leaks? No. The Travelift went away, and the tug-yacht floated on its own for the first time. Clearly, the 37 was not ready for delivery. The lapis Ultrasuede upholstery was swathed in protective plastic sheeting. The carpet was covered with protective padding. Some flat surfaces also were padded, for protection against tools and instruments. Some finishing work was incomplete. Large boxes cluttered the saloon and cockpit. They contained tools, lube oil, antifreeze, transmission fluid, life jackets, fire extinguishers and first-aid kits. 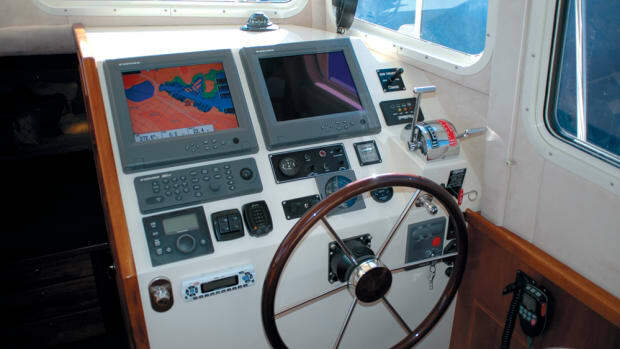 The helm was equally busy: There was a computer, clipboards thick with report forms, several GPS receivers, cell phones, flashlights, a sound meter, a stopwatch, a handheld VHF radio and a bulky digital tachometer that was linked directly to the engine by wires running through the pilothouse hatch. The sea trial crew knew 110 gallons of fuel were put aboard at Burlington, and it measured 8 inches of diesel in one tank and 9 in the second. The seacocks were open and OK. Oil levels in the engine and Onan generator were on the mark, although the level in the hydraulic steering reservoir was down a little. Betancourt was the only novice boater aboard. Husted took time to explain what to do if someone went overboard ("Never take your eyes off him!") and how to use the VHF radio and the cell phone in an emergency. Betancourt would help with lines, and he was reminded not to go on deck without donning a float coat. It made me wonder how many of us who boat regularly do so carelessly. Do we always check oil and coolant levels, look for leaks, and have emergency tools and parts at hand before starting engines? Do we show such patience and understanding in introducing a novice to the important basics while still attached to shore? Do we wear PFDs on deck? "This is like the Navy," Husted tells Betancourt. "I won&apos;t say please or thank you, because they don&apos;t in the Navy." Husted forgot more often than not, and said please and thanks. The crew followed a test report titled "QCWater Procedure." It included inspection procedures to conduct while the boat was still on the Travelift, while in the water but still supported by the lifting slings, and then while it floated but before the engine was started. They checked for leaks around the rudder shaft and propeller shaft seal, at the bow-thruster base at the bow and at water-intake points in the engine room. Fluid levels were checked, enginecontrol cables inspected. Every boat would benefit from a similar checkup now and then. Everything apparently in order, Husted approached the helm. "I am going to start the engine," he says. "Clear?" Having been instructed earlier, the three of us echoed "clear." The engine had been run briefly at the factory, so it was no surprise that it fired instantly. Husted let the engine run at a fast idle while other checks were made throughout the boat, and he shifted it in and out of gear. Then the engine was shut down and all fluids checked again. It was decided a little coolant was needed in the reservoir, and fluid was added to the power steering system. A couple of minor issues appeared in the crew&apos;s first check. A T-fitting on the water heater was leaking. The shower valve had a drip. It was a lot to ask of Betancourt, a young man who has helped build boats at Nordic Tugs and U.S. Marine but who had never operated one. After the 37 cleared the marina breakwater, Betancourt was told to take the wheel and to steer toward a hill on a distant island and to advance the throttle gradually to 1800 rpm. "Listen carefully," Husted advises. "If anything is going to go on the drive train, it will happen now." Betancourt continued to lean on the throttle until the tachometer reached 2800 rpm and the boat was booming along at about 20 knots. (We were running with the current.) Oil pressure and coolant temperature were watched closely; the oil gauge remained constant, while the engine heat ranged between 181 and 185 degrees. Soon, Husted ordered the boat stopped to check that she would back properly at idle speed. That confirmed, he called for hard turns going ahead at maximum revolutions. The 37 cut a tight circle, and Gaylord checked heel with a gauge. Betancourt stopped the boat and then revved it up to make a tight circle in the other direction. It appeared that the boat heeled slightly more on the right turn than the left. After much mulling, Husted and Gaylord decided a slight amount of ballast would be added to trim the boat. Then they remembered the imbalance between the fuel tanks, which led to a trip to the engine room where the crossover valve was found closed. After the valve was opened the fuel levels equalized and the boat was in perfect trim. No ballast required. The hard turns also tend "to squash down those rubber engine mounts," Husted says. And they did. Under way again, the helmsman was told there was a rock dead ahead and was ordered to make a HARD stop. "Let&apos;s see if we can pull the propeller off," Husted says. "Better now than when the owner comes aboard." Following Husted&apos;s directions, Betancourt pulled the shift-throttle lever to neutral, gave the engine a chance to slow and then jammed it hard into reverse and ran the throttle to the stop. The propeller stayed put, but the engine stalled on one maneuver. That was the result of a compromise. Engine idle was set as slow as possible to minimize the boat&apos;s speed through a marina, about 600 rpm and 3 knots. Because the engine is tight, it may stall on that hard reverse the first few times. Back on course, running fast in the channel, a loud vibration developed in the starboard quarter of the boat. It sounded like a muted chainsaw, and the noise echoed through the boat. Gaylord and I went aft in the saloon, checking out the galley stove because it has a record of occasional vibrations. Innocent this time. A loose window? No. How about the cabinets? No. Finally, I touched the small hatch cover in the galley countertop that hides waste storage. The buzzing, booming vibration stopped. The finger hole for lifting had not been cut, but Gaylord managed to squeeze a wad of paper towel into the joint, and all was quiet. Husted took the boat back into the marina for a detailed engine room check. He quickly determined that the hard turns had moved the engine slightly out of alignment. While no misalignment is best, Nordic Tugs allows .002 of an inch of misalignment on the coupler plate; we were .007 of an inch out of line at 2 o&apos;clock on the coupler. So three of us descended into the engine room to tighten stringer bolts and the engine mount bolts. Husted and Gaylord adjusted the mounting bolts and realigned the Cummins diesel. Misalignment may lead to premature failure of reduction gears. It was the most significant problem the crew detected. Betancourt inspected anti-chafing material on electrical cables and decided more protection was needed. Second checking also revealed two loose battery cable connections. I was asked to start the Onan generator and was chagrined when I couldn&apos;t make it run. The preheat would come on, but then the engine would fire and stall. I was looking at Husted while we discussed this problem, and saw the lightbulb in his head click on when he figured it out. Hull No. 82 has a Fireboy fire-suppression system in the engine room. If it discharges, the engine and generator are stopped automatically. When Husted began the detailed engine room check he had disabled Fireboy and, as a result, the generator was cut off as soon as it fired. Fireboy was restored to duty, the Onan started and we had AC power available. Husted ran one more engine check-the slightly scary fast-idle test. The 330-horsepower Cummins, running out of gear, was screaming as it turned 3066 rpm, according to the digital tach. Although this seems unnerving to many boat owners, engine manufacturers recommend an occasional fast idle test to confirm that the engine is operating within factory specifications. Low rpm at fast idle may indicate engine problems. Our Cummins was just fine. By the way, every time the engine room hatch was opened while the engine was running, we all donned earmuffs to protect our hearing. This is a good idea for those who make occasional engine room checks while under way. Betancourt was back at the helm for timed speed runs. He had No. 82 cranked to 2800 rpm and headed for a red buoy slightly more than 3 miles to the north. We knew everything was in good shape. All systems had been operated and tested. Three heating systems (Espar, Heatercraft, King Electric) were switched on, and all poured heat into the saloon. Gaylord and Husted even went through a drill to confirm that the hot water side of every faucet was on the left. The VacuFlush toilet was flushed many times, the DC lights were found to work and all connections got another look. Under way again, attention was focused on engine temperature, engine voltage and the speed we clocked at a range of revolutions. Dead slow idle produced 3.2 knots, 1400 rpm gave us 7.8 knots, while 2800 cranked out 17.2 to 18.7 knots (depending on whether we were running with or against the current), according to the handheld GPS. Husted is an experienced operator of singleengine boats (that&apos;s all Nordic has built, although a twin-engine 52-footer is on the way), but he used the bow thruster often and extensively as a test. Later, while under way, Gaylord checked to see that it was not freewheeling, which would lead to premature wear. No problem there. We also used a stopwatch to time how long it took the thruster to push the bow 90 degrees. It was 22 seconds one direction and a few seconds more in the other (because of an opposing current). Later, Husted would answer the questions many may ask: Is it safe and proper to run a diesel engine with less than three hours of operating time at full throttle for extended periods? Is it right to jam the throttle hard, to make that engine snap and snarl as it responds? His answer: Yes, the consensus is that a new engine should be run hard because that provides a better break-in. But, engines with lots of hours also benefit from occasional shots of full-throttle operation. It&apos;s a way to confirm that they are continuing to operate within normal specifications and that cooling and fuel systems are up to snuff. All may be fine at normal cruising speed, but overheating or smoking at wide-open throttle usually are indicators of problems ahead. Nordic Tugs builds quality boats. Their popularity proves that. The sea trials make them better. We spent a windy winter morning on Fidalgo Bay and Guemes Channel at Anacortes, Washington, slicing through waves and rain showers and tossing spray high into the air. It was a day that left me praising Nordic for the abundance of handholds built into the 37 and for the extra ones the owner had ordered. In an intense, professional manner the three-man crew tested every system-asking the boat to perform beyond any owner&apos;s expectations-and managed to shake loose a few minor problems. I left the boat impressed with the thoroughness of the sea trial and believing that all boat owners should follow some of the team&apos;s rigorous tactics every time they go to sea. Tom Burke, you&apos;re getting a good boat. As for goop on the prop, let me know how it works.